Laser levels are the modern way to install your tiles at 100% certainty that you’re doing it right. Before the introduction of laser levels, most construction workers, plumbers, and engineers used the traditional level or strings to check the alignment and leveling of tiles. Just as the name suggests, laser levels project laser rays horizontally, vertically or at cross lines giving you accuracy that outdoes the tradition levels by far. To help you make a well thought choice, we dived into research and came up with a review of 10 tile laser levels. Whether you’re a professional or you’re new in construction, keep reading to find the one that has all the features that you need. 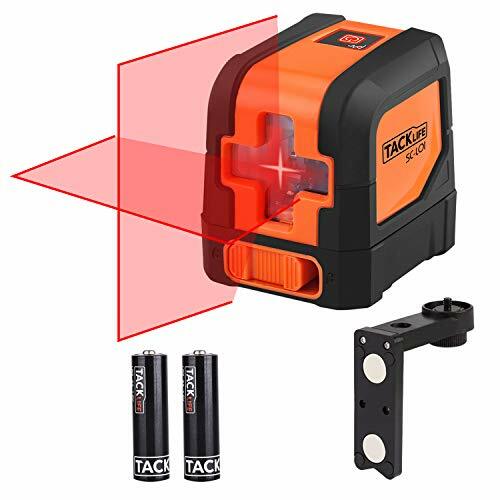 The Tacklife SC-L01 projects red horizontal and vertical line lasers up to 50ft away. It has a leveling accuracy of ±1/8 inches at 30ft. This makes it very accurate when installing your tiles. Because the laser is red, it’s recommended for indoor use where it’s visible. It has a two-mode leveling system. The first mode is automatic leveling which uses the pendulum leveling system to auto-adjust if placed within four degrees of inclination either horizontally or vertically. The second mode is manual leveling which you activate by turning off self-leveling mode. Manual mode comes in handy because you can use the laser at any angle. It can operate in harsh temperatures ranging from -10 to +50 which comes in handy when working under harsh temperatures. It has a ¼” tripod mount which allows for flexible operation. The mount stand has strong magnets enabling it to attach to metallic surfaces for even more adaptability. It comes with weatherproof nylon for storage and 2 AA batteries. 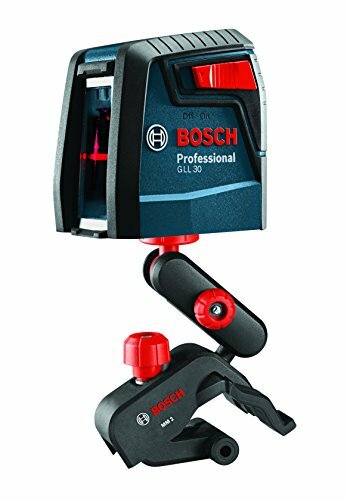 The Bosch GLL 30 is a cross-line red laser level. It projects vertical and horizontal lasers which are quite convenient when installing tiles on your wall or floor. The lasers are visible up to 30 Ft with a precision of ±5/16” at 30 feet. It has a smart pendulum leveling system which auto-levels and indicates when it’s out of level using a blinking laser cross-line. It comes with a MM 2 mounting device which lets you clamp it at almost any surface which is not more than 2.75” thick. This makes it very versatile in leveling many surfaces at any angle. It also has a ¼” mount threading which allows a tripod stand attachment for the free-standing mode. When the GLL 30 is turned off, it pendulum system locks to keep it safe during transportation. The laser has a range of up to 30 Ft and only operates at temperatures between +5 and + 40 which means that it can’t be operated in extreme temperatures. The hammerhead laser offers you three laser modes to choose from depending on your project, i.e., vertical, horizontal or cross-line. It produces red lasers with a range of up to 30 Ft and ±1/4” accuracy which is perfect for tile alignment. 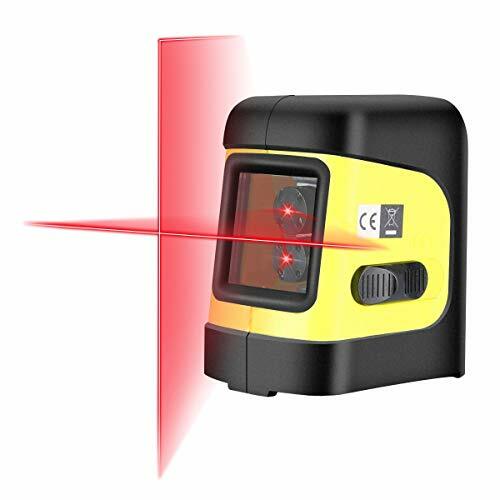 The laser level comes in two leveling modes. The first mode is the self-leveling mode which auto-levels the laser when placed in a 4incline. It also has a led indicator which turns on when the laser is not in level. The second mode is the manual mode which allows you to use the laser at any angle. These modes make the hammerhead laser level very adaptable. The material used to make this laser level, i.e., polyethylene, is dustproof and weatherproof making it very useful in extreme conditions. 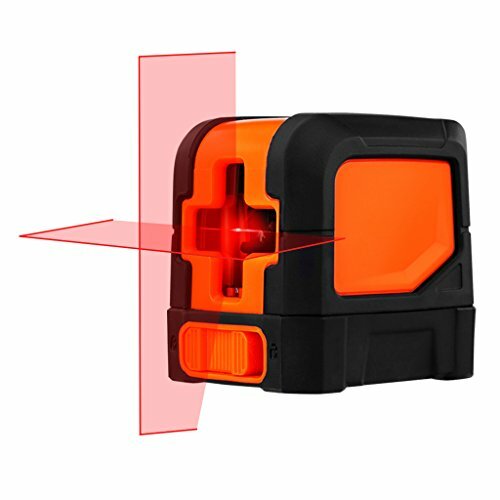 The hammerhead laser level is one of the smallest laser levels meaning it’s quite comfortable to carry around. It comes with a clamp which can be mounted on most surfaces and a ¼” mounting thread for attaching to a compatible tripod stand increasing its flexibility. 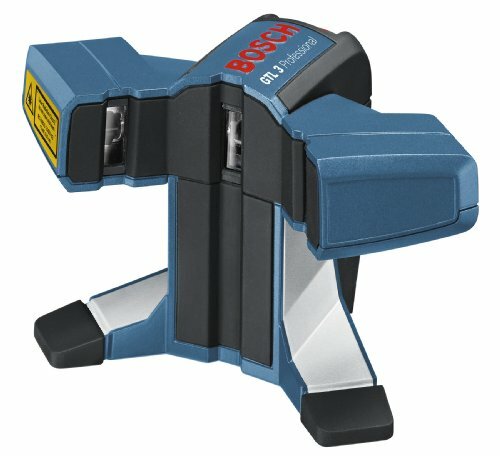 Bosch GTL3 has advanced laser focusing technology. It focuses lasers right in front of its base at 90and 45angle. The lasers pivot point provides a clear starting point for you to start placing your tiles either on the floor or wall. The 90angle lasers help in the alignment of your tiles while the 45angle provides further guidance for more precise tile alignment. The 45angle also provides an ideal orientation for diagonal tile layouts. Its laser output is quite bright with a range of up to 65 Ft, and its accuracy is very high. It’s able to provide clear and precise projection even on rough surfaces. Due to its high precision and laser range, it’s a valuable addition to your toolbox. The GTL3 is IP54 certified which means that it’s waterproof and dustproof making it valuable in construction sites with adverse conditions. The material is also sturdy and strong making this laser level highly durable. Its base has strong magnets which allow attachment to its positioning plate or any other magnetic surfaces on the wall or floor for adaptability and support as you work. 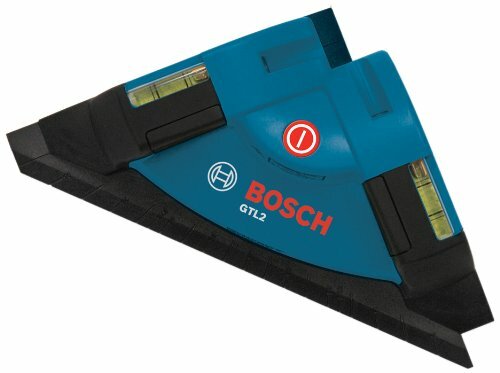 The Bosch GTL2 is an excellent laser guidance tool for 90-degree tile alignment. It projects both horizontal and vertical lasers for use on a perfect use on the wall and floor. The lasers are bright, and their range is up to 30 FT with an accuracy of ±1/2”. The GTL2 features a sticky base which is meant to secure it to the wall and floor for convenience and support when installing tiles. This adhesive, however, seems to wear off after several uses which leaves you with nothing to secure the GTL2. The GTL2 lasers are red which limit it to indoor use due to invisibility when used outside. 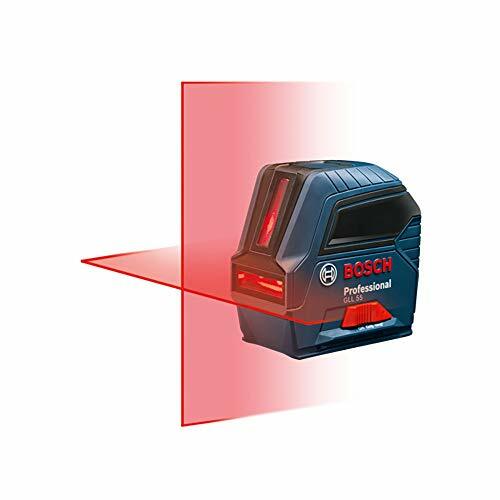 The Bosch GLL 55 is equipped with Bosch’s latest VisiMax technology which enhances the visibility of its lasers. It has three laser projection modes, i.e., vertical, horizontal and cross-line. This lets you choose the laser projection you require as per your project. It has a range of up to 50 Ft under normal working conditions with an accuracy of ±1/8″ at 33 Ft. With this type of range and accuracy in hand, the GLL55 gives you exact results and an easy way to install your tiles. It’s integrated with the Pendulum leveling System which self-levels and indicates when it’s out of level to ensure that all your tiles are aligned correctly. It also has a manual leveling mode which allows you to set the laser level at any angle making it perfect for unique tile layout projects. The GLL55 is IP54 certified meaning that it’s waterproof and dustproof enabling it to withstand the harsh conditions of any construction site. It comes with a magnetic L mount which can be attached to ferrous materials increasing its adaptability to construction sites. It also has two mount threading, i.e., 5/8-11″ and ¼-20″ for tripod support increasing its versatility even further. The Suaoki L12R features cross-line laser projection for a perfect alignment of your tiles. Its lasers have a range of up to 33 Ft with an accuracy of ±1/9” at 30 Ft. It comes with two leveling modes, i.e., the manual mode and the self-leveling mode. The self-leveling mode auto-levels when there’s an incline of up to 4either horizontally or vertically. If the incline is more than 4 the laser starts flashing to give you a warning that it’s not leveled. The manual mode lets you use the laser level at any angle. This two-mode setting makes the level quite flexible. The materials used to make the L12R are IP54 certified making it weatherproof. This means that it can withstand hazardous conditions of any construction site. Its materials are also strong making it sturdy and durable. The L12R has a ¼” mount thread which lets you use it together with a tripod stand for a more flexible working condition. The Firecore F112R allows you to choose from its three laser modes, i.e., horizontal, vertical or cross-line laser mode. This gives you options depending on how you’re installing your tiles. It uses red lasers for leveling which make it more usable as an indoor leveling laser. The L112R has a range of up to 42 Ft with an accuracy of ±1/8” at 30 Ft. This makes it very precise and a handy tool to have when aligning your tiles. The level laser can operate on either self-leveling mode where it auto-adjusts at ±4or manual mode where you can focus the laser at any angle. The two modes are quite helpful, e.g., the manual mode helps during the installation of guardrails which requires the laser to be at an angle. It comes with a magnetic mounting base which makes it possible to attach on any metallic structures for more plasticity when working. It also has 1/4”-20 screw thread for mounting it on a stand to increase steadiness and to make it possible to angle the laser. It has an IP54 certification meaning it’s resistant to both water and dust making it suitable for use in harsh environments. 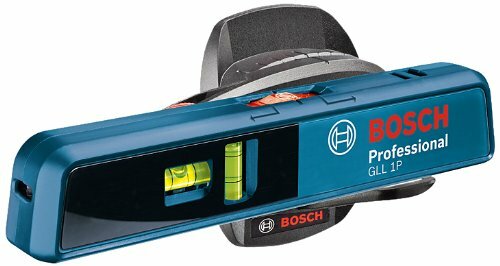 The Bosch GLL 1P is a versatile and simple combination of line and point laser level. This makes it useful for all the basic tile alignment projects. Its point laser range is 65 Ft, and the line laser range is 16ft with a line laser accuracy of ±3/16” at 33 Ft. The GLL 1P can be used as a spirit level because it has two bubble vials for vertical and horizontal leveling which gives you good alignment precision. This level laser is perfect for horizontal, vertical and angular tile leveling giving you an all versatile leveling and alignment laser. The level has built-in magnets to allow attachment to metallic surfaces which makes angular leveling easy. It’s also mountable on a tripod stand via its 1/4-20″ mount thread for more productivity. Johnson Level and Tool 40-6616 project two red lasers on the surface at a 90angle which is perfect for installing tiles. The lasers have a range of 30 Ft with an accuracy of ±1/4″ at 60 Ft making it very reliable and perfect for leveling and tile alignment. The level has a led signal which blinks in case the leveling is not correct. This helps you adjust it until the right level is reached. It comes with a weatherproof storage bag which increases the durability of the level laser when not in use. The 40-616 level can project its lasers over water and concrete making it a go-to tool when operating under harsh conditions. It has a built-in protractor which helps you calculate and establish angles easily. A). Material: The materials used in making the level laser determine the sites where it can be used and its durability. If you are planning to use your tile laser regularly or in harsh conditions, buy a weatherproof tile laser for durability and better performance. B). Laser mode: level lasers can come in horizontal, vertical or cross-line level laser modes. Buy the one that suits your necessitates best and is more versatile in case you plan to work on several different projects requiring different level laser modes. C). Leveling mode: there are two modes of leveling, i.e., manual and automatic. A level laser containing both modes is always better because it can self-level when in automatic mode and can be used in angular alignments when in manual mode. D). Laser properties: the laser features determine a lot about a level laser. First, the color of the laser decides whether the tile level is suitable for both outdoor and indoor use or not. Red lasers are for indoor use while green lasers can be used for both indoor and outdoor purposes. The range and accuracy per Ft of your tile laser determine the level of perfection of your tile’s alignment and its ease of use. Is it safe to look into the lasers? Although very useful in leveling, lasers are dangerous to your eyes because they can cause damage. Avoid laser-eye contact as you install your tiles. 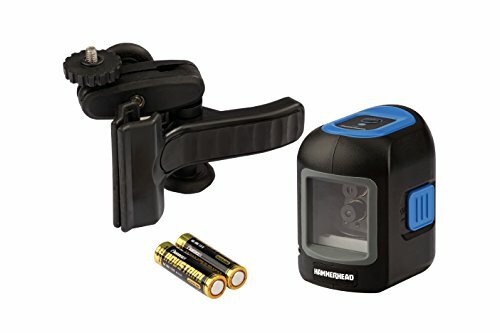 What is the perfect laser level to buy? The level should be one that matches your requirements. If you are operating in unfavorable weather conditions, obtain a weatherproof one. If you’re working outside buy one with a visible laser. Always buy the one that best fits your needs. How many types of laser levels are there? There are three main types of laser levels, i.e., horizontal, vertical, and cross-line laser levels. Laser levels are more accurate than traditional levels. Their accuracy varies depending on the model you’re using, but on average, they have an accuracy of ±1/4” per 40 Ft.
Tile level lasers are an essential part of any construction or renovation as they provide precision in both leveling and alignment of tiles. 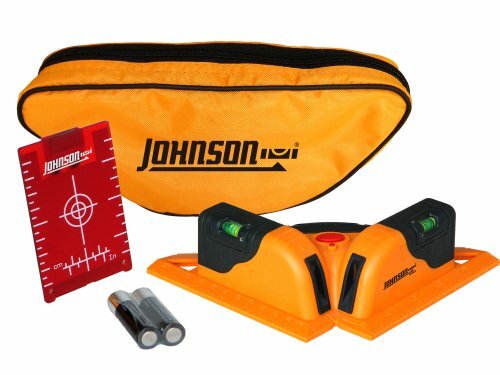 Choosing the right laser level for your project is always a priority, and we hope that this review of the best tile laser levels helped you make a well-informed decision on the one you should purchase.